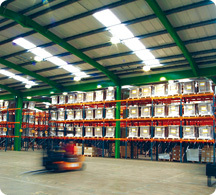 DK Fulfilment is an approved premise for ‘dry’ customs bonded warehousing. It allows our customers to defer payment of import duty and VAT. This gives our customers the opportunity to buy in bulk from their suppliers when exchange rates are favourable or to have the satisfaction of knowing your goods are in the country for Christmas/new product launch. Goods can also be re-worked whilst in bond massively improving cash flow. Located in Coventry, just off the M6 and within a four hour drive of 90% of the UK’s population, our large Midlands storage facility is in easy reach of many of the UK’s key ports and airports. With 165,000 square feet, our warehouse facilities‘ large capacity enables our customers to store all dry bonded stock in a single, premium quality location; saving time and money. Once DK Fulfilment receives information from our customers that the goods are en-route to the UK, we will deal with all customs procedures and related paperwork. Full door-to-door quotes are also available. We will then notify you when the stock is received and booked in; this information is then available to download from our system. Once the goods require de-bond, again we will deal with all the paperwork and move the goods into our pick/pack warehouse section or load on to a vehicle for onward delivery. Fully approved and regularly audited by HM Revenue & Customs, DK Fulfilment’s Dry Bonded warehouse provides storage solutions for imported goods. Customs Bonded warehousing can result in a significant cash flow advantage for the importer. Our warehouse storage facility combines both 24/7 manned security and full CCTV coverage to ensure the safeguarding of our customers’ invaluable stock. Our advanced Warehouse Management System and web-based access to stock records provides our customers with instant reports of product levels and status.